Q: Where can I get it? Q: How can I get it? 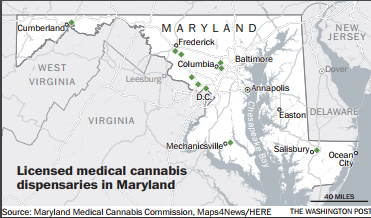 A: First, you have to register as a patient with the Maryland Medical Cannabis Commission. Then you need a certification from a doctor or other health-care provider registered with the state. With a limited supply and a market, many dispensaries are limiting initial sales to patients who have already have registered with them. Q: Does medical marijuana need to be smoked? Maryland law does not allow edible medical marijuana products – such as brownies, cookies and gummies – which are popular in other states. Q: How do I find a doctor who will recommend marijuana? A: Maryland doesn’t want unscrupulous doctors handing out phony marijuana recommendations for anyone who pays. Providers need to meet with patients in person and have a “bona fide” relationship with them before issuing certifications (which aren’t called prescriptions, for legal reasons). The list of doctors registered to recommend marijuana isn’t public, but some are advertising their willingness. Q: How much does medical marijuana cost? A: It’s unclear at the moment, but dispensaries have been warning patients to expect unusually high prices in the early stages of the program. Q: Can patients from other states purchase marijuana? A: The law allows nonresidents to participate if they are being treated in Maryland (such as cancer patients receiving chemotherapy). But the commission is not registering out-of-state patients (a.k.a. medical marijuana reciprocity), while it reviews its policies. It is a federal offense to transport marijuana across state lines – even to the District, Delaware and Pennsylvania, where the use of medical marijuana also is legal. Q: What conditions qualify for treatment with cannabis? A: The law lists these conditions as treatable with medical cannabis: Cachexia or wasting syndrome, anorexia, severe pain, severe nausea, seizures, severe or persistent muscle spasms, glaucoma, post-traumatic stress disorder and chronic pain.